As we celebrate more than 9 years of Bitcoin’s operation, I’d recently found myself pensive about the origins of the world’s longest standing decentralized cryptocurrency. To satisfy my curiosity, I decided to perform some analysis of Bitcoin’s first month of operation: specifically, the first 3000 blocks. I was inspired to do this analysis after reading an article written by Balaji S. Srinivasan in which he proposed a measure for quantifying a cryptocurrency’s decentralization. I was particularly interested in his analysis of coin decentralization. Defined as the distribution of coins among known addresses, coin decentralization can also be thought of as the total wealth equality among owners of a cryptocurrency. I was curious as to whether the wealth equality among Bitcoin owners changed within the first month of its operation and, if so, why it changed. Before we start, it’s necessary to ask how we can formally define wealth equality. Interestingly enough, it’s easier to define wealth inequality than it is wealth equality. Wealth Inequality — The unequal distribution of assets among individuals in an economic system. In our context, wealth inequality is the unequal distribution of the total circulating supply of Bitcoin among all Bitcoin owners. To think of this in a more practical sense, we can imagine that there are 10 Bitcoin in circulation and 10 total Bitcoin addresses in existence. If 1 address owns all 10 Bitcoin, then the wealth among the addresses is very unequal since one address owns all of the money and the 9 others have none to spend. Conversely, if the 10 Bitcoin are equally distributed among all 10 of the Bitcoin addresses, then the wealth among the addresses is completely equal since each address owns the same amount (1 Bitcoin). Economists often quantify wealth inequality using the Gini Coefficient. The Gini Coefficient can range from 0 to 1, where 0 represents total equality and 1 represents no equality. It’s natural to say that wealth inequality and wealth equality are inversely related, so a higher Gini Coefficient means less wealth equality. 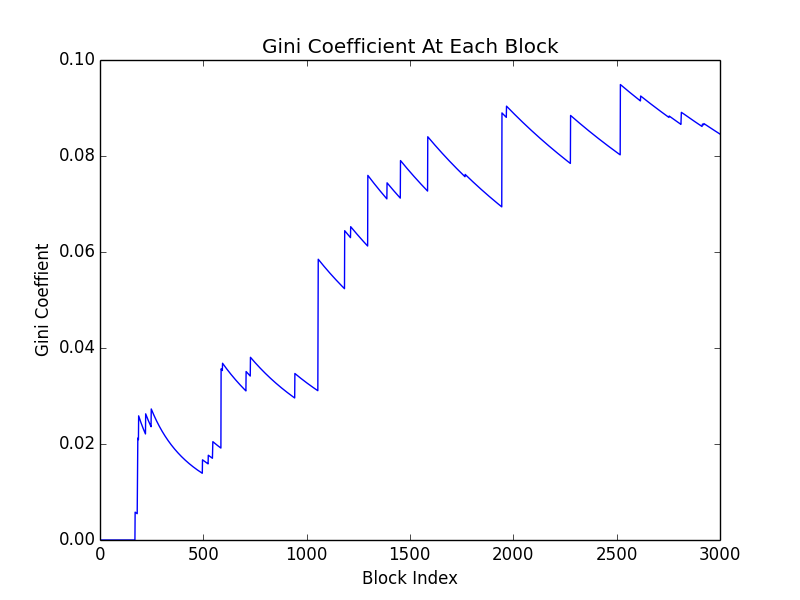 To determine how wealth equality changed in the first 3000 blocks of Bitcoin, we’ll calculate the Gini coefficient at each block and study our findings. Using the Blockchain API, I was able to retrieve information about each block from height 0 to height 2999. 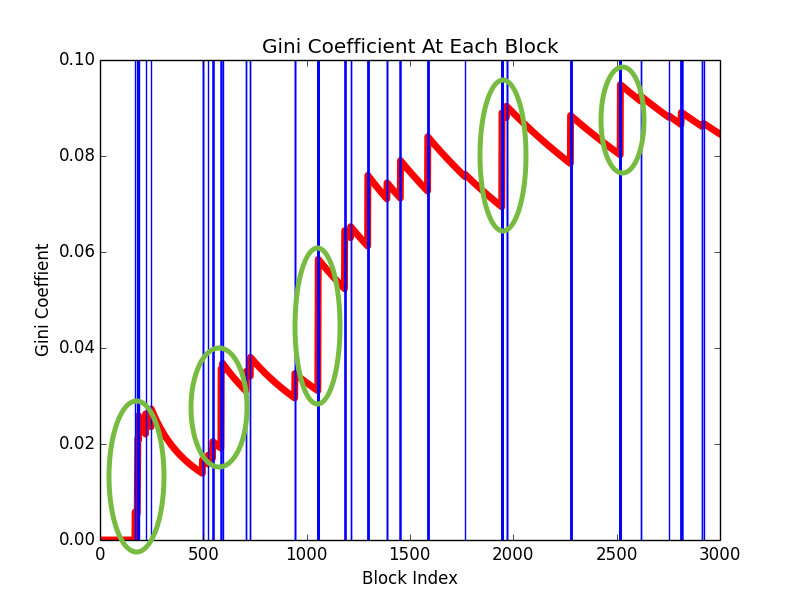 After calculating the Gini Coefficient at each block by monitoring the balance at each address with respect to the total amount of coins circulating at a block, I was able to find data represented by the following chart. As we can see, the Gini Coefficient increases over time, which means that the total wealth equality of Bitcoin owners decreases as the network neared its 3000th block. This chart is telling us that certain addresses started owning a disproportionate amount of Bitcoin in the network’s first month of operation. Why is that, though? Are miners of later blocks earning more coins than earlier miners? Were the early miners redistributing the wealth by sending their coins to other users? Did some miners mine more blocks than others? To find the answer to these questions, we need to look more closely. Are miners of later blocks earning more coins than earlier miners? One could reason that a factor in the increasing wealth inequality during Bitcoin’s early days is miners of newer blocks being rewarded with more Bitcoin per block than miners of older blocks. 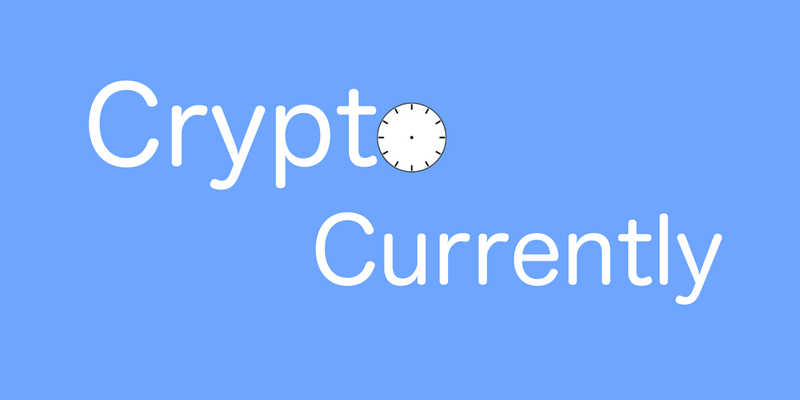 To answer this question, however, we have to see the circulating supply of Bitcoins at each block. If the rate at which new coins were minted was not constant, then it’s true that miners earned a different amount of coins over time and wealth was not equally distributed during minting of new coins. 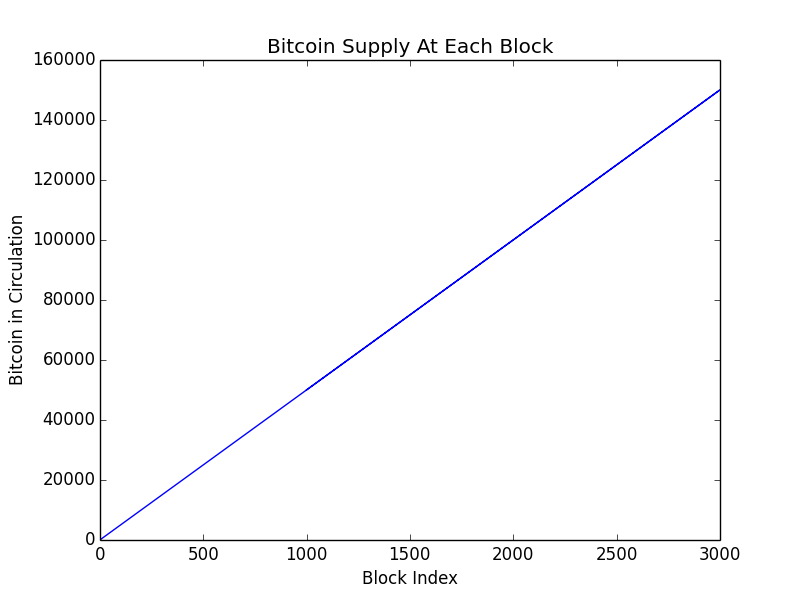 The following chart shows the supply of Bitcoin at each block. As we can see, the rate at which new Bitcoin were minted was constant. This is evident because of the straight line: it shows us that 50 new Bitcoin existed after each new block. Therefore, the miner who mined the 3000th block earned the same amount of Bitcoin as the miner who mined the first block. This proves that a change in mining rewards alone did not factor into the increase of wealth inequality. It’s important to note that a block reward of 50 Bitcoin per block was specified by the protocol until block #210000, so we could have disregarded this option without processing the blockchain data. There are a few more cases in which the wealth can still be unequal: miners who earn block rewards could be sending their new coins to others, and/or some addresses could be mining more blocks than others. It’s also important to keep in mind that these approaches are not mutually exclusive, however, as multiple factors can simultaneously influence wealth equality. Did some addresses mine more blocks than others? Another factor that could have influenced the increase in wealth inequality is whether some addresses mined more blocks than others. If some addresses mine more blocks than others, then they could be getting a disproportionate amount of block rewards. 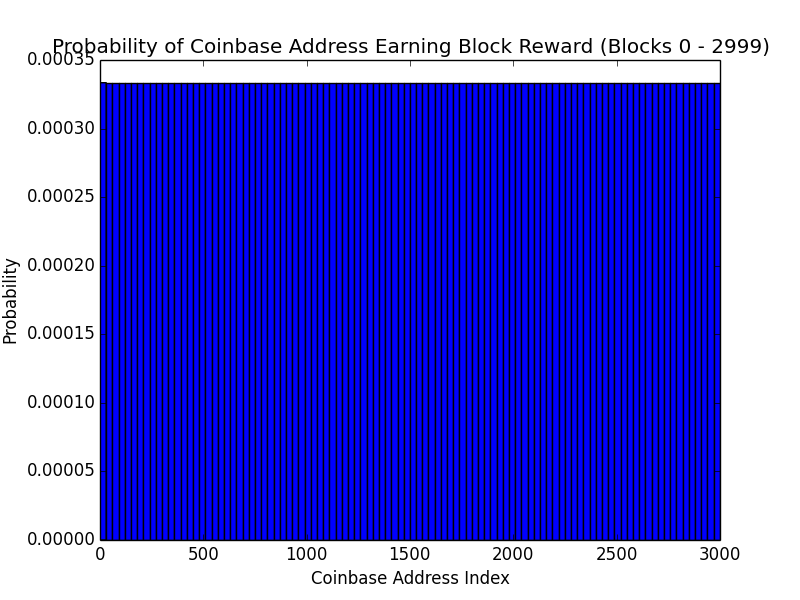 We can see if this is the case by viewing the probability distribution of each of the coinbase addresses (an address that earns block rewards) earning the reward of a block between heights 0 and 2999, where a uniform distribution means that each block was mined by a unique address and a non-uniform distribution means that a certain number of addresses mined more blocks than others. The data can be viewed below. The above histogram shows a uniform probability distribution, which means that each block was mined by a unique address and thus proves that no address mined more of the first 3000 blocks than another. Knowing that each block was mined by a different address gives us confidence that every mining address earned 50 Bitcoin during mining. This means that some addresses ended up owning more than others neither by earning more coins per block nor by mining more blocks. We can deduce from this that some addresses are sending Bitcoin to others and redistributing the wealth. Were the early miners redistributing the wealth by sending coins to other users? Although wealth redistribution is no clear indicator of increasing or decreasing wealth equality, its existence does indicate that there is a change in wealth equality. We have a record of every transaction that took place, so we can use this information to differentiate the coinbase transactions from the normal transactions and see how the normal transactions influence the wealth inequality. To see this, we’ll show the chart of the Gini Coefficient at each block again. But, we’ll also plot vertical lines whenever a user sent Bitcoin to another and redistributed the wealth. 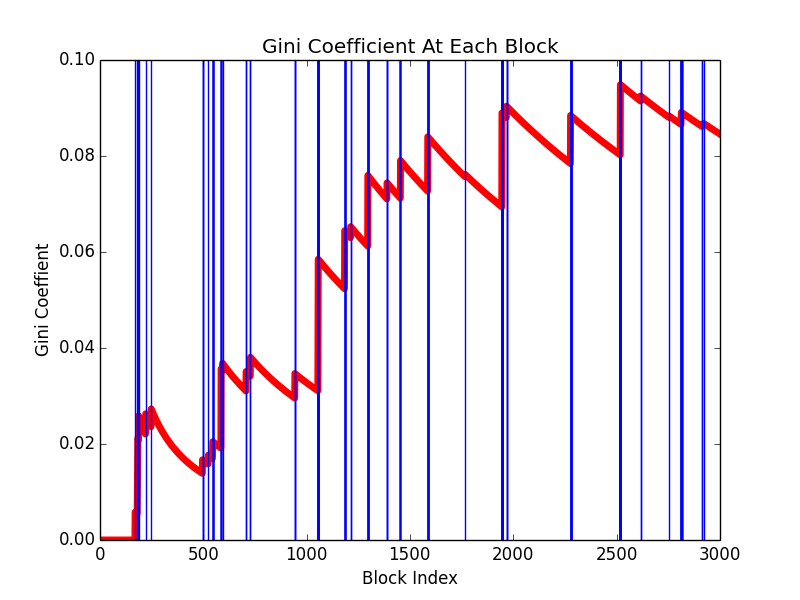 Here, the red line is the Gini Coefficient at each block, and the blue lines are times when Bitcoin were sent from one address to another. As we can see, the wealth inequality across the network decreases (red line slopes down) after some times someone sends Bitcoin to another and increases (red line shoots up) other times after someone sends Bitcoin to another, with the cumulative inequality still tending to increase over time. With this, it’s evident that wealth redistribution has a significant influence on the wealth inequality of the network. This also gives us reason to believe that some addresses might not have always HODL’d their coins. While I do not have data to confirm at the time of this writing, I speculate that some of the normal transactions significantly increase the total wealth inequality. I believe this is the case, because the Gini Coefficient significantly increases at the same time that a normal transaction takes place as can be seen when a vertical blue line intersects with the red line and the red line shoots up. The events of interest are circled in green. In the end, there are multiple factors that could simultaneously influence the wealth equality of the Bitcoin network. In this article, we were able to discuss a few factors that could have significantly influenced the decrease of the cumulative wealth equality (and thus coin decentralization) during Bitcoin’s first 3000 blocks. It appears as if the reason for the decrease in wealth equality is redistribution of wealth by certain addresses. 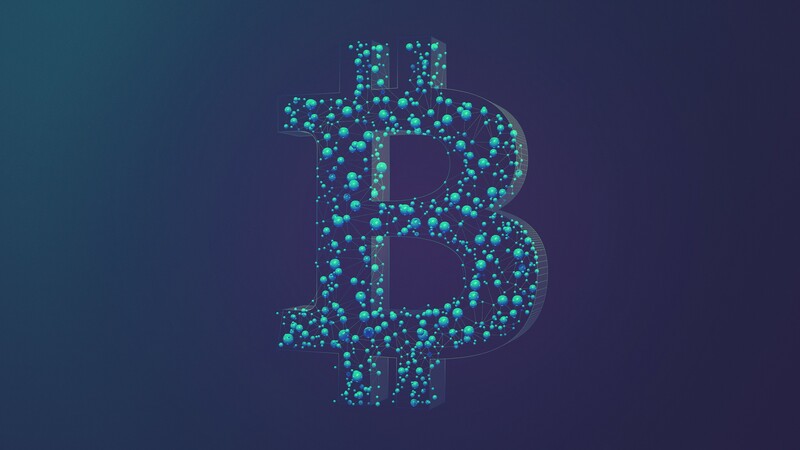 More specifically, some addresses send their newly earned Bitcoin to other addresses so that more of the coins concentrate toward the balances of a shrinking group of addresses. This is likely because Bitcoin is subject to the Pareto Principle. There were a few limitations pertaining to this research. The most relevant is that the distribution of wealth among addresses does not directly correlate with the distribution of wealth among users, since creating and owning wallets is a trivial task, and each of the addresses used throughout the first 3000 blocks could have been owned by one person. Another limitation is that we’re only studying the first 3000 blocks (since that’s all my laptop’s RAM could handle 😉). Should we have studied the first year or the entire blockchain at the time of your reading, we could have easily seen different results. As a matter of fact, Balaji reported a Gini Coefficient of 0.65 when researching Bitcoin coin decentralization in 2017. Bitcoin and many other cryptocurrencies are deemed by many as new vehicles for great wealth redistribution. While they are, in fact, adding more individuals to the upper class, cryptocurrencies are still subject to the same economic laws that stratify our current societies. Whether this approach toward another unequal system will continue is up to society, but there’s no doubt that these digital currencies are changing the world around us as we know it. This article is sponsored by Bitlit (getabitlit.com). Bitlit offers a catalog of fun and interesting clothing items that breathe new life into the modern day technologist. Designers, programmers, administrators, entrepreneurs, and daily users of technology can now feel represented when wearing Bitlit apparel. Remember: when you get a Bitlit, you gotta show it off!